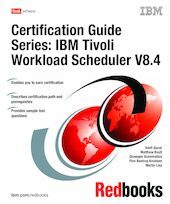 This IBM Redbooks publication is a study guide for IBM Tivoli Workload Scheduler Version 8.4 and is aimed at readers who want to obtain IBM Professional Certification for this product. The IBM Tivoli Workload Scheduler Version 8.4 Certification, offered through the Professional Certification Program from IBM, is designed to validate the required skills for technical professionals who implement the IBM Tivoli Workload Scheduler Version 8.4 product. This book provides a combination of theory and practical experience required for a general understanding of the product. It also provides sample questions that help you evaluate your personal progress and provide familiarity with the types of questions that you encounter in the exam. This publication does not replace practical experience, nor is it designed to be a standalone guide. Instead, when combined with education activities and experience, this book is an effective tool that can provide invaluable preparation for the exam. For your convenience, we structure the chapters based on the sections of the IBM Tivoli Workload Scheduler V8.4 Implementation Certification test, such as planning, installation, and configuration. Each topic corresponds to one section of the exam and enables you to prepare for that section.